We should not be surprised that atoms, molecules, or ions must collide before they can react with each other. Atoms must be close together to form chemical bonds. This simple premise is the basis for a very powerful theory that explains many observations regarding chemical kinetics, including factors affecting reaction rates. The reacting species must collide in an orientation that allows contact between the atoms that will become bonded together in the product. The collision must occur with adequate energy to permit mutual penetration of the reacting species’ valence shells so that the electrons can rearrange and form new bonds (and new chemical species). Carbon monoxide is a pollutant produced by the combustion of hydrocarbon fuels. To reduce this pollutant, automobiles have catalytic converters that use a catalyst to carry out this reaction. It is also a side reaction of the combustion of gunpowder that results in muzzle flash for many firearms. If carbon monoxide and oxygen are present in sufficient quantity, the reaction is spontaneous at high temperature and pressure. Although there are many different possible orientations the two molecules can have relative to each other, consider the two presented in [link]. In the first case, the oxygen side of the carbon monoxide molecule collides with the oxygen molecule. In the second case, the carbon side of the carbon monoxide molecule collides with the oxygen molecule. The second case is clearly more likely to result in the formation of carbon dioxide, which has a central carbon atom bonded to two oxygen atoms This is a rather simple example of how important the orientation of the collision is in terms of creating the desired product of the reaction. Illustrated are two collisions that might take place between carbon monoxide and oxygen molecules. The orientation of the colliding molecules partially determines whether a reaction between the two molecules will occur. If the collision does take place with the correct orientation, there is still no guarantee that the reaction will proceed to form carbon dioxide. Every reaction requires a certain amount of activation energy for it to proceed in the forward direction, yielding an appropriate activated complex along the way. As [link] demonstrates, even a collision with the correct orientation can fail to form the reaction product. In the study of reaction mechanisms, each of these three arrangements of atoms is called a proposed activated complex or transition state. Possible transition states (activated complexes) for carbon monoxide reacting with oxygen to form carbon dioxide. Solid lines represent covalent bonds, while dotted lines represent unstable orbital overlaps that may, or may not, become covalent bonds as product is formed. In the first two examples in this figure, the O=O double bond is not impacted; therefore, carbon dioxide cannot form. The third proposed transition state will result in the formation of carbon dioxide if the third “extra” oxygen atom separates from the rest of the molecule. In most circumstances, it is impossible to isolate or identify a transition state or activated complex. In the reaction between carbon monoxide and oxygen to form carbon dioxide, activated complexes have only been observed spectroscopically in systems that utilize a heterogeneous catalyst. The gas-phase reaction occurs too rapidly to isolate any such chemical compound. Collision theory explains why most reaction rates increase as concentrations increase. With an increase in the concentration of any reacting substance, the chances for collisions between molecules are increased because there are more molecules per unit of volume. More collisions mean a faster reaction rate, assuming the energy of the collisions is adequate. The minimum energy necessary to form a product during a collision between reactants is called the activation energy (Ea). The kinetic energy of reactant molecules plays an important role in a reaction because the energy necessary to form a product is provided by a collision of a reactant molecule with another reactant molecule. (In single-reactant reactions, activation energy may be provided by a collision of the reactant molecule with the wall of the reaction vessel or with molecules of an inert contaminant.) If the activation energy is much larger than the average kinetic energy of the molecules, the reaction will occur slowly: Only a few fast-moving molecules will have enough energy to react. If the activation energy is much smaller than the average kinetic energy of the molecules, the fraction of molecules possessing the necessary kinetic energy will be large; most collisions between molecules will result in reaction, and the reaction will occur rapidly. This graph shows the potential energy relationships for the reaction The dashed portion of the curve represents the energy of the system with a molecule of A and a molecule of B present, and the solid portion the energy of the system with a molecule of C and a molecule of D present. 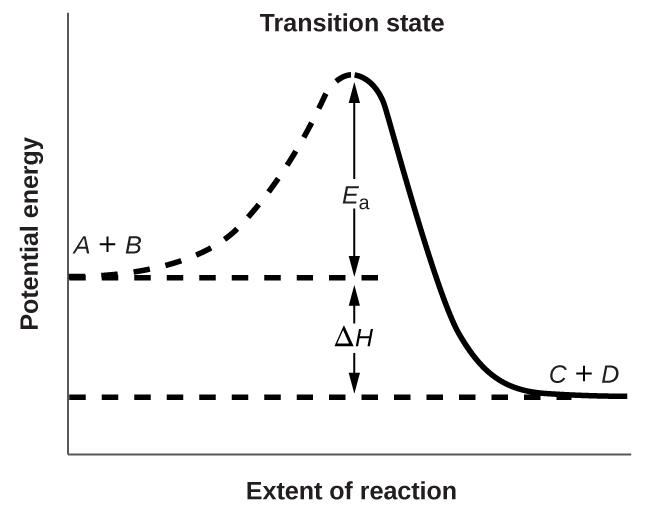 The activation energy for the forward reaction is represented by Ea. The activation energy for the reverse reaction is greater than that for the forward reaction by an amount equal to ΔH. The curve’s peak represents the transition state. In this equation, R is the ideal gas constant, which has a value 8.314 J/mol/K, T is temperature on the Kelvin scale, Ea is the activation energy in joules per mole, e is the constant 2.7183, and A is a constant called the frequency factor, which is related to the frequency of collisions and the orientation of the reacting molecules. Both postulates of the collision theory of reaction rates are accommodated in the Arrhenius equation. The frequency factor A is related to the rate at which collisions having the correct orientation occur. The exponential term, is related to the fraction of collisions providing adequate energy to overcome the activation barrier of the reaction. At one extreme, the system does not contain enough energy for collisions to overcome the activation barrier. In such cases, no reaction occurs. At the other extreme, the system has so much energy that every collision with the correct orientation can overcome the activation barrier, causing the reaction to proceed. In such cases, the reaction is nearly instantaneous. The Arrhenius equation describes quantitatively much of what we have already discussed about reaction rates. For two reactions at the same temperature, the reaction with the higher activation energy has the lower rate constant and the slower rate. The larger value of Ea results in a smaller value for reflecting the smaller fraction of molecules with enough energy to react. Alternatively, the reaction with the smaller Ea has a larger fraction of molecules with enough energy to react. This will be reflected as a larger value of a larger rate constant, and a faster rate for the reaction. An increase in temperature has the same effect as a decrease in activation energy. A larger fraction of molecules has the necessary energy to react ([link]), as indicated by an increase in the value of The rate constant is also directly proportional to the frequency factor, A. 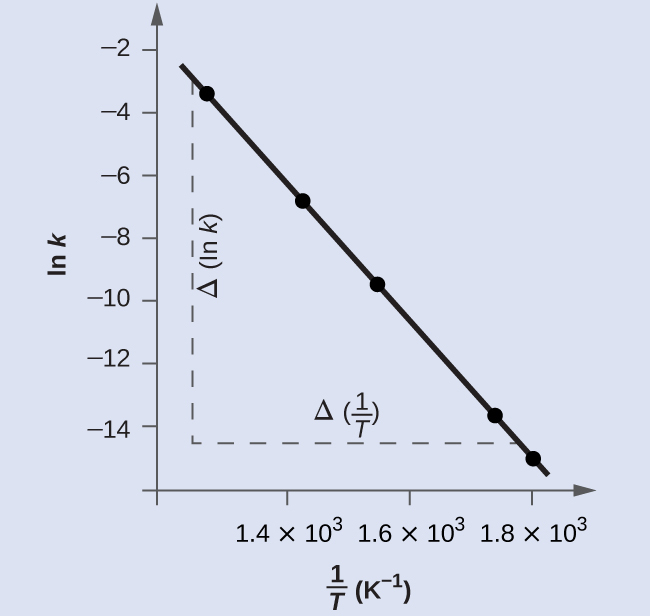 Hence a change in conditions or reactants that increases the number of collisions with a favorable orientation for reaction results in an increase in A and, consequently, an increase in k.
(a) As the activation energy of a reaction decreases, the number of molecules with at least this much energy increases, as shown by the shaded areas. (b) At a higher temperature, T2, more molecules have kinetic energies greater than Ea, as shown by the yellow shaded area. Thus, a plot of ln k versus gives a straight line with the slope from which Ea may be determined. The intercept gives the value of ln A. The variation of the rate constant with temperature for the decomposition of HI(g) to H2(g) and I2(g) is given here. What is the activation energy for the reaction? [link] is a graph of ln k versus To determine the slope of the line, we need two values of ln k, which are determined from the line at two values of (one near each end of the line is preferable). For example, the value of ln k determined from the line when is −2.593; the value when is −14.447. This graph shows the linear relationship between ln k and for the reaction according to the Arrhenius equation. and the result is Ea = 185,900 J/mol. This method is very effective, especially when a limited number of temperature-dependent rate constants are available for the reaction of interest. Assuming the kinetics of this reaction are consistent with the Arrhenius equation, calculate the activation energy for this decomposition. Chemical reactions occur when reactants collide. What are two factors that may prevent a collision from producing a chemical reaction? The reactants either may be moving too slowly to have enough kinetic energy to exceed the activation energy for the reaction, or the orientation of the molecules when they collide may prevent the reaction from occurring. When every collision between reactants leads to a reaction, what determines the rate at which the reaction occurs? What is the activation energy of a reaction, and how is this energy related to the activated complex of the reaction? The activation energy is the minimum amount of energy necessary to form the activated complex in a reaction. It is usually expressed as the energy necessary to form one mole of activated complex. Account for the relationship between the rate of a reaction and its activation energy. Describe how graphical methods can be used to determine the activation energy of a reaction from a series of data that includes the rate of reaction at varying temperatures. from which Ea may be determined. How does an increase in temperature affect rate of reaction? Explain this effect in terms of the collision theory of the reaction rate. (a) How much faster does the reaction proceed at 45 °C than at 25 °C? In an experiment, a sample of NaClO3 was 90% decomposed in 48 min. Approximately how long would this decomposition have taken if the sample had been heated 20 °C higher? The rate constant at 325 °C for the decomposition reaction is 6.1 10−8 s−1, and the activation energy is 261 kJ per mole of C4H8. Determine the frequency factor for the reaction. The rate constant for the decomposition of acetaldehyde, CH3CHO, to methane, CH4, and carbon monoxide, CO, in the gas phase is 1.1 10−2 L/mol/s at 703 K and 4.95 L/mol/s at 865 K. Determine the activation energy for this decomposition. An elevated level of the enzyme alkaline phosphatase (ALP) in the serum is an indication of possible liver or bone disorder. The level of serum ALP is so low that it is very difficult to measure directly. However, ALP catalyzes a number of reactions, and its relative concentration can be determined by measuring the rate of one of these reactions under controlled conditions. One such reaction is the conversion of p-nitrophenyl phosphate (PNPP) to p-nitrophenoxide ion (PNP) and phosphate ion. Control of temperature during the test is very important; the rate of the reaction increases 1.47 times if the temperature changes from 30 °C to 37 °C. What is the activation energy for the ALP–catalyzed conversion of PNPP to PNP and phosphate? In terms of collision theory, to which of the following is the rate of a chemical reaction proportional? (a) In neutral solution, k = 2.1 10−11 s−1 at 27 °C and 8.5 10−11 s−1 at 37 °C. Determine the activation energy, the frequency factor, and the rate constant for this equation at 47 °C (assuming the kinetics remain consistent with the Arrhenius equation at this temperature). (b) When a solution of sucrose with an initial concentration of 0.150 M reaches equilibrium, the concentration of sucrose is 1.65 10−7M. How long will it take the solution to reach equilibrium at 27 °C in the absence of a catalyst? Because the concentration of sucrose at equilibrium is so low, assume that the reaction is irreversible. (c) Why does assuming that the reaction is irreversible simplify the calculation in part (b)? (b) 1.81 108 h or 7.6 106 day. (c) Assuming that the reaction is irreversible simplifies the calculation because we do not have to account for any reactant that, having been converted to product, returns to the original state. Use the PhET Reactions & Rates interactive simulation to simulate a system. On the “Single collision” tab of the simulation applet, enable the “Energy view” by clicking the “+” icon. Select the first reaction (A is yellow, B is purple, and C is navy blue). Using the “straight shot” default option, try launching the A atom with varying amounts of energy. What changes when the Total Energy line at launch is below the transition state of the Potential Energy line? Why? What happens when it is above the transition state? Why? Use the PhET Reactions & Rates interactive simulation to simulate a system. On the “Single collision” tab of the simulation applet, enable the “Energy view” by clicking the “+” icon. Select the first reaction (A is yellow, B is purple, and C is navy blue). Using the “angled shot” option, try launching the A atom with varying angles, but with more Total energy than the transition state. What happens when the A atom hits the BC molecule from different directions? Why? The A atom has enough energy to react with BC; however, the different angles at which it bounces off of BC without reacting indicate that the orientation of the molecule is an important part of the reaction kinetics and determines whether a reaction will occur. Collision Theory by OpenStaxCollege is licensed under a Creative Commons Attribution 4.0 International License, except where otherwise noted.